Get ready for a seafood smorgasbord! What’s in your bag? Click for more. 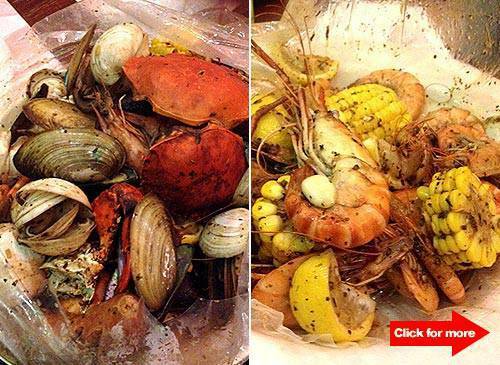 (SPOT.ph) When it comes to seafood, Clawdaddy’s Great American Picnic over at Bonifacio High Street has it in the bag-literally. Instead of the usual season-then-steam approach which lets out most of the deliciousness, Clawdaddy has procured a special food-safe, boil-safe plastic bag to cook the goodies in, effectively trapping the smorgasbord of delicious spices inside until the moment you choose to devour them. The Boiling Bag, served in the clear plastic pouch, is far from the appetizing display we’re used to seeing, but when the waiter cuts through it releasing the natural salty whiff of seafood mingling with full-bodied smell of spices, it’s almost like opening presents on Christmas morning. Choose from five packages, five marinades, and your preferred degree of spiciness. 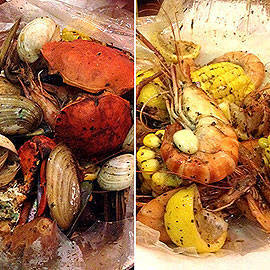 There’s the Seafood Boil In A Bag (P1,495), a feast of crabs, freshwater prawns, South Pacific clams, green mussels, and Manila clams; the All Shrimp Boiling Bag (P995), with baby shrimps and freshwater prawns; Shellfish Boiling Bag (P995), which features South Pacific clams, giant white mussels, Manila clams, and green mussels; the Maryland Crab Boiling (P1,495), a stew of freshwater crabs; and the Louisiana Crab and Shrimp Boiling Bag (P1,495), a set of freshwater crabs and prawn. Every bag also comes with spicy Andouille sausage, potatoes, and corn. For flavors, you can opt for the more organic Boiling Bags or the Seafood Boil Spice. Or, add a little heat with Creole Cajun or Clawdaddy Spice. A milder take is the Garlic Butter marinade which masks the fishy scent and is not at all greasy.